Billy Barron at the picnic with his owner, Elizabeth Barron and also his mother "Piper" with her owners and my dear friends, Heather and Jim O'Keefe. 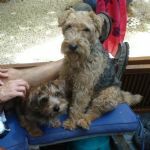 Doing what a Lakeland does best, "Sleeping"
Roly and Omega (brother & sister) from one of my first litters. Sadly both Roly and Omega passed over the Rainbow Bridge in 2007 aged 17. Roly with a young Jenifer visiting us at Sandimorn just before he passed on. Roly & Omega were lovingly owned by Heather & Jim O'Keefe our very dear friends. Roly & Omega all dressed up for Christmas. Baby Billy Barron. A very happy chappy. "Riley" owned by Phil Addison. Riley is Hally's litter brother. Hayley will be 12 on April 29th 2009, but still runs us ragged haha, she is in very good health and is a much loved member of our family, we are very thankful that you allowed us to be her parents. "Aust Ch Sandimorn Rapt in Red"
Our puppies are well socialised thanks to our dear friends who often visit when we have a litter. (Aunty Karin with a baby Jenifer) closely watched by Lochie.